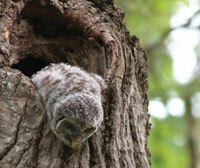 In beautifully detailed photographs, Mary Holland captures the first few months of a baby barred owl’s life. 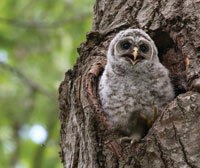 The huge eyes and fluffy feathers will steal the hearts of readers as they learn how barred owl parents ready their young owlets for the big world outside the nest. 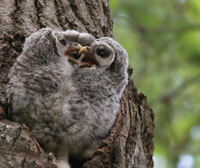 Follow along as Otis learns to eat, fights with his sister, and prepares for flight. This nonfiction picture book with a cuddle factor includes a 4-page For Creative Minds section in the back of the book and a 35-page cross-curricular Teaching Activity Guide online. 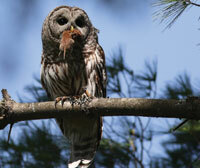 Otis the Owl is vetted by experts and designed to encourage parental engagement. Its extensive back matter helps teachers with time-saving lesson ideas, provides extensions for science, math, and social studies units, and uses inquiry-based learning to help build critical thinking skills in young readers. The Spanish translation supports ELL and dual-language programs. The interactive ebook reads aloud in both English and Spanish with word highlighting and audio speed control to promote oral language skills, fluency, pronunciation, text engagement, and reading comprehension. Tap animals and other things that make noise to hear their sounds. Vetters: Thanks to Margaret Fowle, Conservation Biologist with Audubon Vermont, and to Sandy Beck, Education Director at the St. Francis Wildlife Association, for verifying the accuracy of this book. 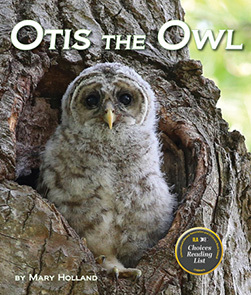 Otis the Owl is a must–have for the elementary classroom and at–home libraries and this 32–page book, stocked with superior factual information about owls, will not sit on the shelf for very long! 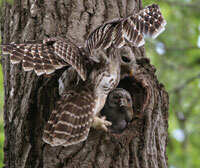 Holland, a naturalist and a skilled nature photographer, offers a visually captivating picture book on owls. Watch in wonder as Otis transforms from a tiny ball of fluff into a predator on the cusp of stretching his feathers beyond the safety of his family tree, in Otis the Owl, a real-life glimpse into the world of the woodland Barred Owl. Nature photographer Mary Holland’s breathtaking images capture the fierce beauty found in birds of prey, and candid commentary educates and enlightens while engaging audiences with questions, quizzes, and creative thinking.